This is a simply wonderful example of a scarce American Officers’ Hanger circa 1760-1780, complete with its original scabbard. While the sword itself is quite rare, the scabbard is extremely scarce, and there are probably not more than a handful of original scabbards in existence today. In general, these swords were somewhat roughly made American copies of British swords of the era. The swords typically have a crudely executed cast brass Lion’s Head pommels, and any decoration usually quite simple. The details in the lion’s heads are usually achieved by means of punch dots or sometimes by simple engraving. The quality of the brass pommel castings tended to vary and some of the crudest forms bear far more resemblance to a monkey than a lion. The guards are typically of brass as well, and the handles are usually American hardwoods, such as cherry and apple wood. 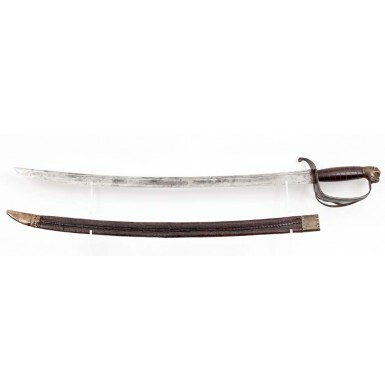 Due to the variance found in the pommel castings, it is believed that this pattern of sword was made by at least a handful of American makers. 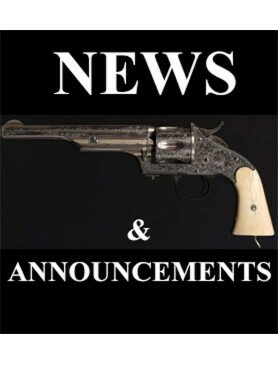 It is generally believed that the swords were produced both prior to, and during the American Revolution, in the New England area. Most extant examples that have any strong provenance are associated with Massachusetts and the surrounding colonies. While some authors still debate whether these hangers were for use by officers or enlisted men, I feel that the quality and some of the small features of this sword indicate that it was most likely an officers’ hanger. The sword is the classic American pattern hanger from the era, with a simply cast brass lion’s head pommel in its most rudimentary form. While the casting is simple and lacks the detail of a British made sword or an American made silver hilted sword, it is still much better than most of the of the examples known today. While the sword itself is nearly identical to the #49.SS, from the Bill Guthman collection, depicted on page 320 of George Neumann’s Battle Weapons of the American Revolution, it is at once of notably higher quality. The quality of the simple casting is significantly superior to the Guthman example and while it is lacking in detail, is still much more detailed than the example pictured in the book. The lion’s head is enhanced with simple punch dot decorations around the eyes and muzzle, and has grotesquely oversized triangular teeth accentuated within the mouth. The guard is also of higher quality than most examples encountered today. The simple brass “D” shaped guard has a pair of decorative slots on either side at the blade to hilt juncture and a pair of decorative incised lines add simple elegance to the bottom portion of the hand guard. A pair of cleanly executed, sweeping brass branches enhance the right side of the guard. The top of the guard bends forward gracefully and is tipped with a rudimentary flat oval quillon. The simple turned wood grip is probably made from cherry, and has an oval cross section with a slight palm swell. The grip is further enhanced with 8 wraps of 2-strand twisted brass wire. 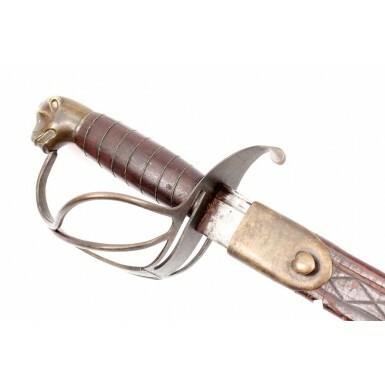 The additional guard branches, the quality of the pommel casting and the addition of the fine twisted wire wrap all suggest that this was an officers’ sword and not an enlisted man’s sword. 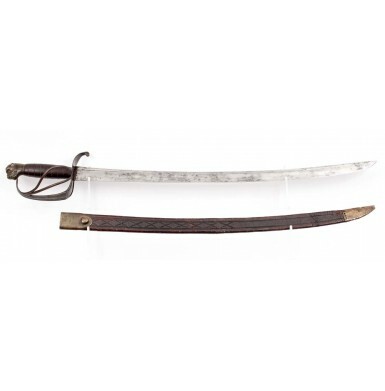 The sword is clearly and infantry hanger, as it has a shorter blade than a typical horseman’s sword and has a thin and decorative leather scabbard with a frog button, designed for wear on baldric. The blade is a simple, single edged blade with a rudimentary false edge near the tip and a single fuller near its spine. The blade is slightly curved and is attached to the hilt via its tang, which is peened at the top of the lion’s head. The scabbard is thin, well finished leather of very high quality. 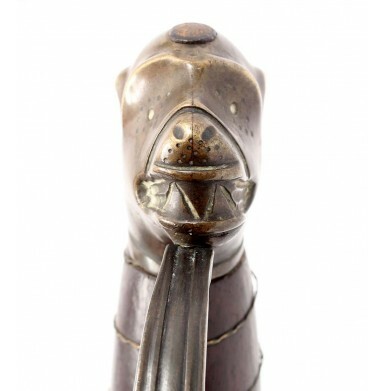 The face of the scabbard is decorative with a pair of incised lines that run the length of the scabbard and contain 10 incised “X” decorations, interspersed with single dots, that start just above the bottom of the throat and continue about 2/3 of the way down the face of the scabbard. The rear of the scabbard shows a very high quality double seam its entire length, and a pair of decorative incised lines, much like the pair on the front. The scabbard mounts are a sheet brass throat and drag. Both are crimped onto the leather with small, round puncture marks. The throat has an elegant, heart shaped frog stud, to allow the scabbard to be hung from a frog or baldric. The sword measures about 32 1/8” in overall length, with a 26 1/8” blade that is 1 5/16” wide at the ricasso, and a hilt that is approximately 6” long. The Guthman collection example, that is so similar and is cited above, measures 32” in overall length, with a 26 ““ x 1 ““ blade. The overall condition of this fabulous Revolutionary War American Officers’ Hanger is about FINE. The sword blade has a medium pewter gray patina, with scattered patches and blotches of darker, lightly oxidized age discoloration over the entire blade. The blade if full length and is free of any breaks, cracks or repairs. The blade has only some very minor and very lightly scattered pitting present, with the majority of the blade being quite smooth with only some lightly scattered pinpricking and minor peppering present. The blade shows some light sharpening, probably from the period of use, and some light cleaning, which is likely more recent. The edge of the blade shows some minor nicks and dings, nothing extreme, but typical of a sword that saw real use in the field. The blade to hilt juncture is tight and secure with no wobble in the blade, hilt or guard. The tang of the sword is securely peened at the top of the lion's head, and the peening appears completely original and undisturbed. The two-piece brass hilt and guard is in VERY FINE condition. The brass has a deep, dark and untouched bronze patina and is very attractive. The guard is free of any bends, dings or dents, and shows some nice sand casting roughness on the interior and some period of production tool marks. The exterior of the guard is beautifully polished and smooth, with a rich, undisturbed patina. The guard is secure at both the ricasso and the lion’s head pommel cap, with no wiggle or wobble. 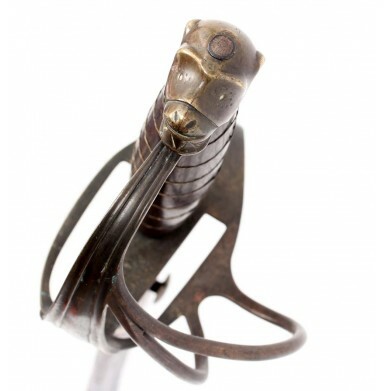 The rudimentary lion’s head pommel is quite striking in its simplicity. The limited details in the casting remain crisp and sharp, as do the punch dot enhancements. The pommel retains the same untouched patina as the balance of the hilt and guard, and the only areas of brightness are a couple of small areas along the high edges (along an ear and eyebrow), where handling and contact have thinned the patina and polished the brass slightly. The grip is a lovely piece of American hardwood, almost certainly cherry. It is secure and solid, but does have a few very old drying cracks along the grain of the grip. These remain tight and secure and in no way detract from the display of this wonderful sword, but are mentioned for exactness. The grip retains what appears to be its original thin, two-strand brass wire wrap. The wire remains tight and secure with no looseness or loss. The grips also shows some minor bumps and dings from handling and use, but no serious damage or wear, and is free from an breaks or repairs. The extremely rare leather scabbard is in VERY FINE condition as well. The scabbard is solid and complete and appears to be full length with no alterations. The scabbard appears to have shrunk a small amount over the last 250+ years, but is only about ““ shy of fully covering the blade of the hanger. 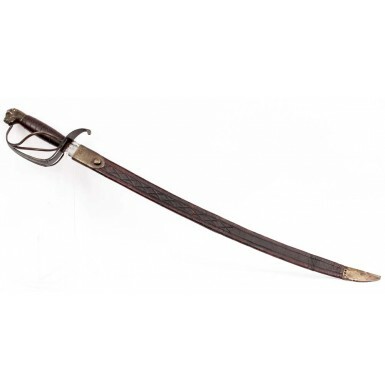 The scabbard retains the large majority of its original rich, chocolate brown finish. The leather shows some light scuffing; light flaking and some minor finish loss, but nothing significant. There is also some light to moderate crazing to the surface finish over the entire scabbard, but this is insignificant when the age of the scabbard is considered. In fact, even though this scabbard is at least 100 years older than a Civil War era scabbard, this scabbard would be in excellent condition for a Civil War era sword! The two lines of stitching at the rear of the scabbard appear to be original and remain tight and secure, as does the seam itself. The two sheet brass mounts appear to original as well, and have the same deep, untouched patina as the brass guard and hilt of the sword. The throat has a delicately executed heart shaped frog stud, to allow the scabbard to be hung from a baldric or frog. The drag shows a number of bumps and dings and is broken at the bottom, where a finial was probably originally attached, but is missing now. Overall, this is a really fabulous example of an American made Revolutionary War era officers’ short sword and scabbard. These early, American made swords are quite rare and very desirable, but the scabbard is the real jewel. Revolutionary War era scabbards simply have not survived the 250 years since they were originally made. The scabbard alone makes this piece a potential centerpiece for any significant Revolutionary War collection. 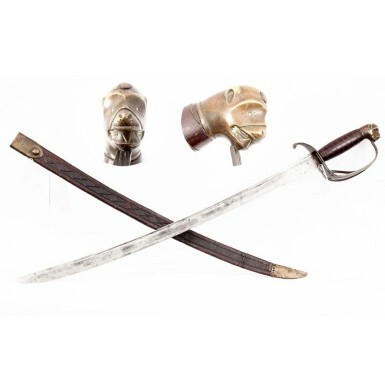 When you add the quality, condition and beauty of the sword, you have a really fantastic, “must have” show piece for a top quality Revolutionary War display.